The World Trials U.S. Grand Prix is coming to town. And if you have any appreciation at all for man’s ability to defy gravity on two wheels, you won’t want to miss it. 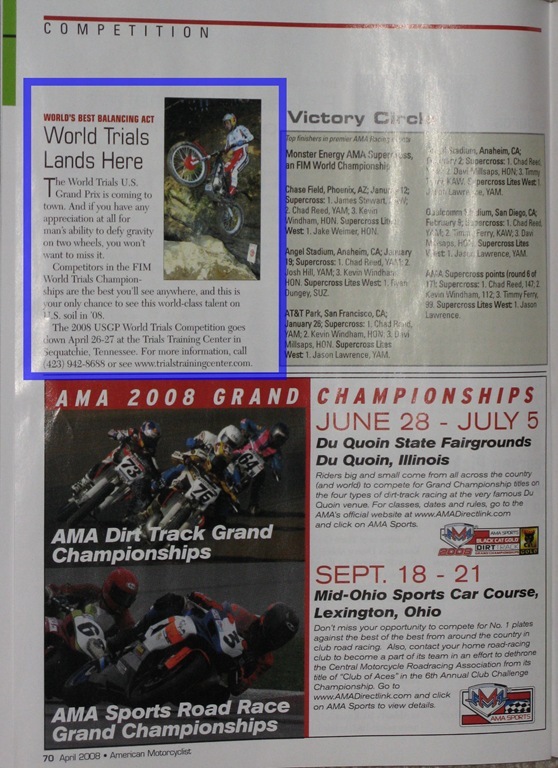 Competitors in the FIM World Trials Championships are the best you’ll see anywhere, and this is your only chance to see this world-class talent on U.S. soil in ’08. The 2008 USGP World Trials Competition goes down April 26-27 at the Trials Training Center in Sequatchie, Tennessee. For more information, call (423) 942-8688 or see www.trialstrainingcenter.com.